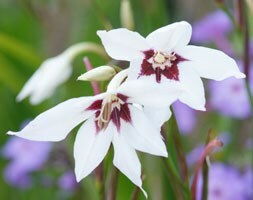 Bulb Size: 6-8cm Delightful spikes of nodding, funnel-shaped, highly fragrant white flowers, with a prominent burgundy blotch at the base of each petal, seem to dance on the breeze at the ends of their slender stems from late summer. It is a delightfully elegant plant that is ideal for adding movement to a sunny border. Plant it in clumps throughout the beds, or pot them up and keep them on the patio next to a seating area or often-used pathway, where you will be sure to make the most of the heady scent.